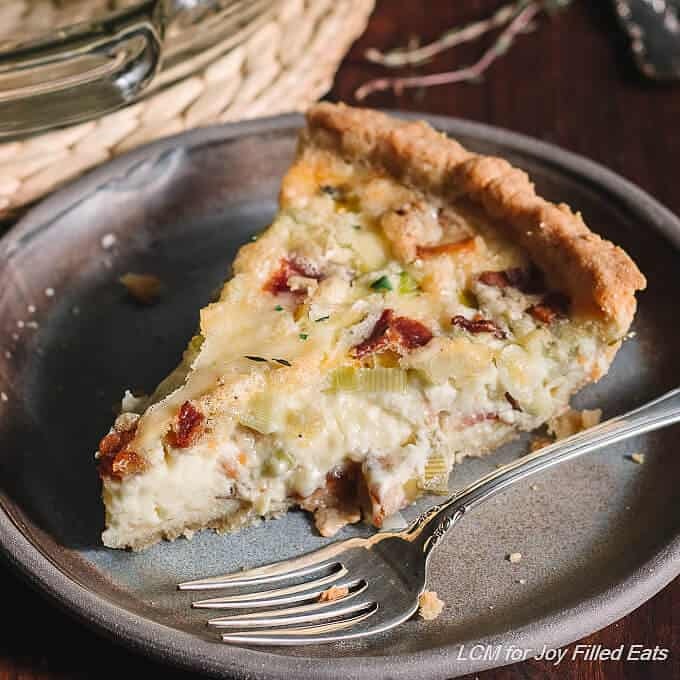 This beautiful Low Carb Quiche with Bacon & Leeks comes to you from my friend Kimberly of Low Carb Maven. She has many amazing recipes and some of the most gorgeous food photography. I love just looking through her blog at her photos. 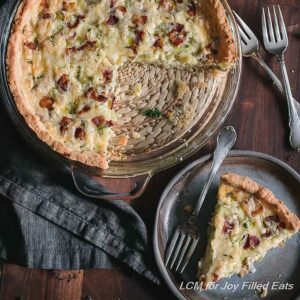 I can’t wait to make this delicious quiche she is generously letting me share here at Joy Filled Eats. 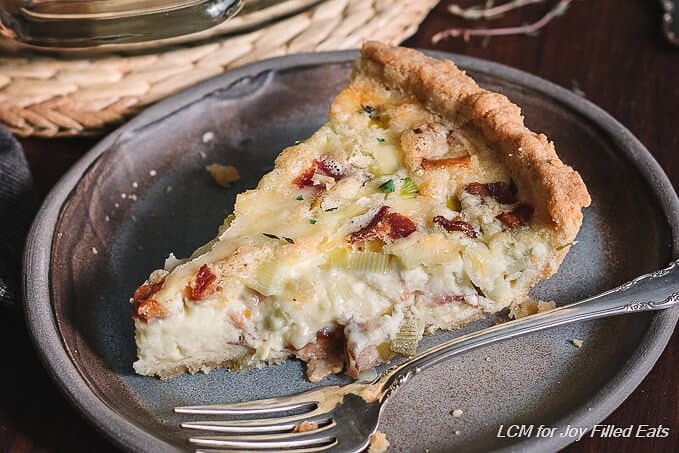 I’d like to thank Taryn for inviting me to Guest Post on Joy Filled Eats and share this delicious bacon leek quiche recipe, a family favorite. A quiche is one of the most versatile dishes in your baking repertoire. A good quiche can be eaten at any time of day and enjoyed hot or at room temperature. When my kids were small, I made myself a quiche every Sunday to reheat for breakfast during the week. I warmed it in the microwave and ate it while I fed them. When my husband and I started our low carb journey, I made two quiches each Sunday – a breakfast casserole for him and a crustless bacon spinach quiche for me. This helped us keep our morning carbs in check every day. Keeping carbs consistent helped us lose weight. What I like about quiches is that they are easy to make and can be made with so many kinds of ingredients. I often make my quiches crustless but cooking them in a muffin tin is great for portion control and results in a grab-and-go type of breakfast. I really love these spinach feta muffin quiches baked in a muffin tin lined with ham. And who can resist a classic mini quiche for an appetizer or a snack? 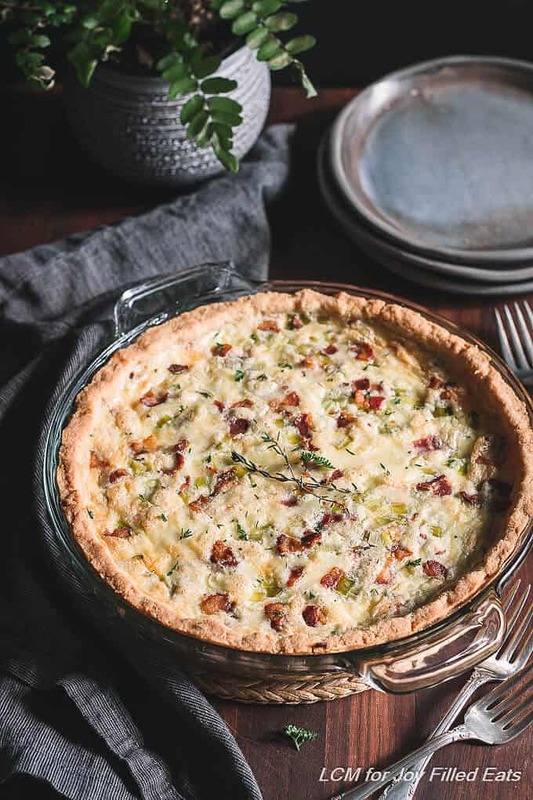 This bacon leek quiche is the epitome of buttery creaminess. The crust is flaky, the bacon is salty and smoky and the leeks add a nice oniony flavor. 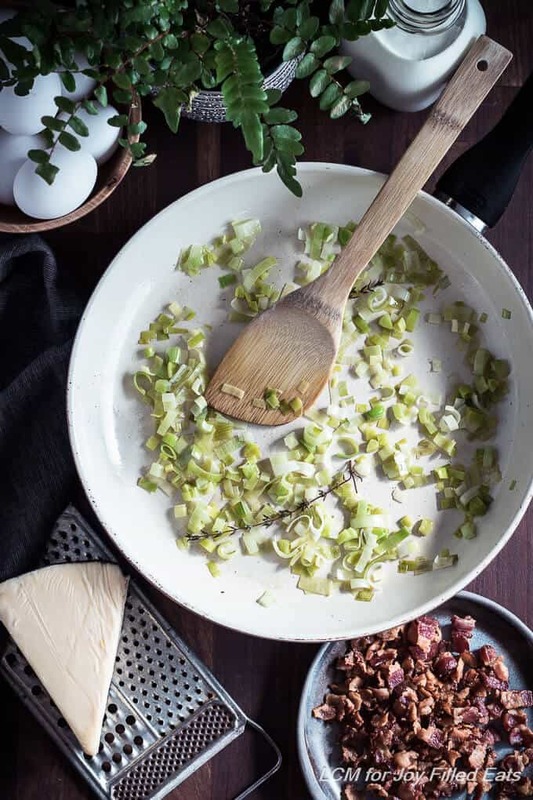 If you’ve never had leeks before, you’re in for a treat – they taste like onion, garlic, shallot, and green onion all mixed up together, only milder. To ensure the proper texture, the leeks need to be sweated until soft. Adding some wine adds a nice flavor but is only optional (see substitution). Make sure the bacon is nice and crisp so it keeps its integrity in the custard – soggy bacon is not fun to eat. Baking the quiche on a lower rack ensures that the bottom is thoroughly cooked and eliminates pre-baking and a soaked crust. Kim Hardesty develops low carb and keto recipes in her Southern California home. 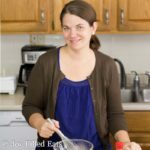 Her recipes can be found on her blog Low Carb Maven. Follow her on Facebook and Instagram. 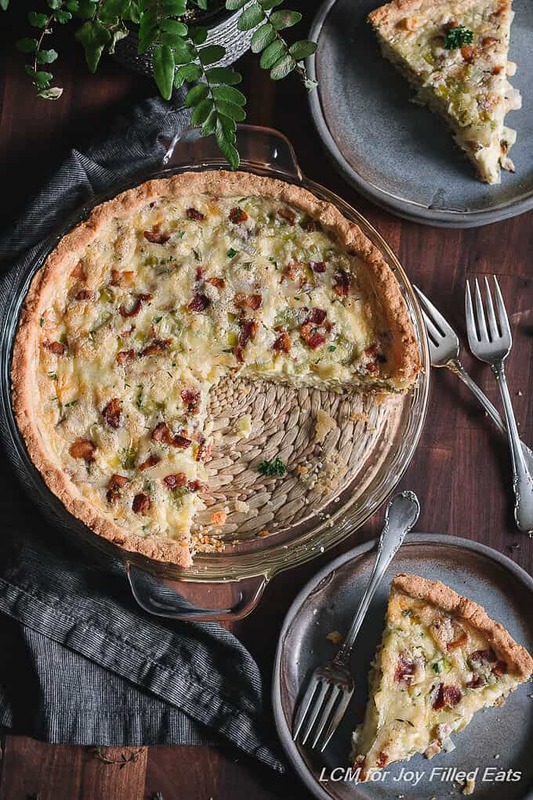 This bacon leek quiche is the epitome of buttery creaminess. The crust is flaky, the bacon is salty and smoky and the leeks add a nice oniony flavor. 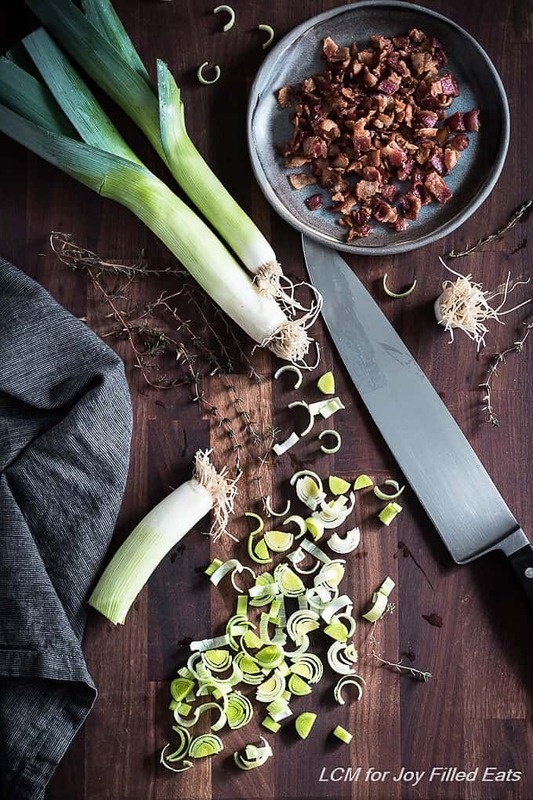 If you’ve never had leeks before, you’re in for a treat - they taste like onion, garlic, shallot, and green onion all mixed up together, only milder. Crust: Follow directions for the pie crust, put it in a 9-10 inch pie plate, but do not dock or bake. Cover and refrigerate until needed. Preparation: Preheat oven to 350 degrees F and move rack to the lower third of the oven. Clean the leeks by slicing off the root end and the dark green leaves. Then, slice the leeks lengthwise and place under running water to remove any dirt hiding between the leaves. Cut the leeks crosswise into ¼ inch thick slices. Procedure: Dice the bacon. Place it into a cold pan over medium heat and cook until crispy, occasionally stirring - about 5-6 minutes. Remove the bacon from the pan and pour out all of the bacon fat except for 1 tablespoon. Reduce the heat to medium-low and add the leeks and thyme, stirring to coat. Sauté 1 minute and carefully add the wine. Stir and cover, turning the heat to low and cooking until the leeks are soft - about 10 minutes. Add water if necessary and modulate heat as needed. Place the custard ingredients into a medium bowl and beat with a hand mixer until nice and frothy. Add ? of the cheese to the crust, spreading out evenly, followed by ? of the bacon and leeks. Layer the ingredients finishing with just a little cheese on top. Mix the custard again and gently pour over the filling ingredients. Bake: Place the quiche into the oven and bake for 30-40 minutes or until the quiche is just set in the middle. Remove from the oven and cool. Serve warm or at room temperature. A salad with a vinaigrette dressing is the perfect accompaniment. Refrigerate any leftover quiche. Serves 8.
do we have to use a crust? It a) makes it more complicated and b) makes it more calories. Nope! You can make this crustless. I prefer a crust when I'm trying to impress company but when I'm just cooking for myself I skip it. Thank you, Taryn, for sharing my recipe with your audience. I hope they enjoy it as much as we do.